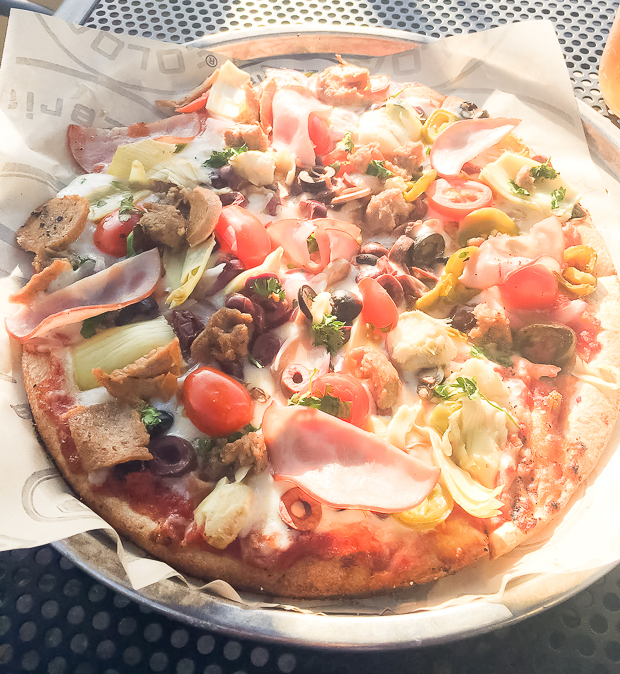 In case you haven’t been there yet, Pieology is kind of the “Subway” of pizzas. You can choose from one of their “favorite” personal artisan style pizzas like “Mad to Meat You,” and “Smokin’ Buffalo Chicken,” or you can create your own, which we prefer. Half the fun of going there is choosing your own toppings and experimenting with all the fun combinations you can come up with. Their pizzas are only available in one size (11.5 inches). We typically split one pizza (we find it’s more than enough for two people), but we had a coupon for a free pizza this time, so we went for two. You can create your own pizza with as many toppings as you want for under $10. Say WHAT?! You read that right. AS MANY TOPPINGS AS YOU WANT. You can also choose the type of house-made crust you want (we went for wheat). They also have gluten-free for those with Celiac Disease. For toppings, we chose mozzarella cheese, tomatoes, olives, Canadian bacon, artichokes, spinach, and Italian sausage. We decided to keep it pretty classic for this pizza and it definitely hit the spot. Todd didn’t mind the beer from Coronado Brewing Company, either (anyone else tried the Orange Wit??). I’m not much of a beer drinker, but I tried a few sips of the Orange Wit and really like the fresh citrus zing. Cheers to that. 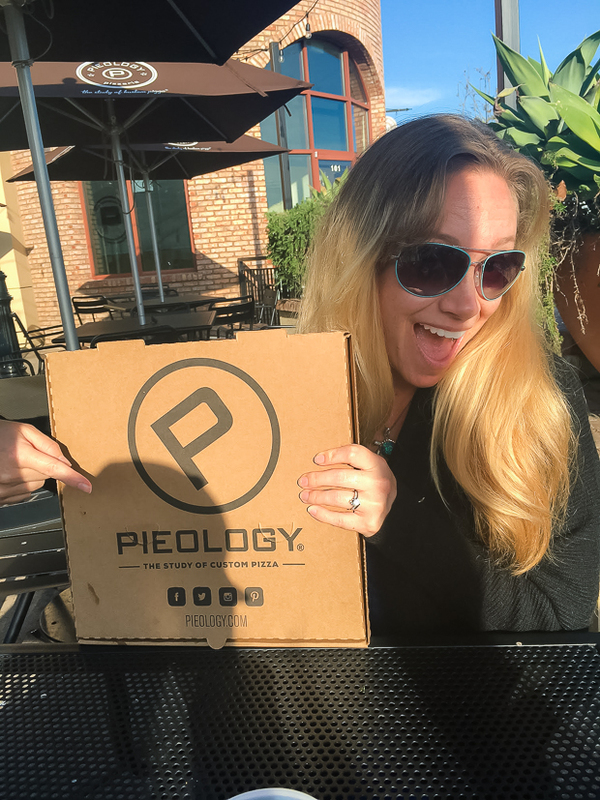 The outdoor patio at Pieology Carlsbad offers a relaxing atmosphere to kick back and enjoy your pizza. 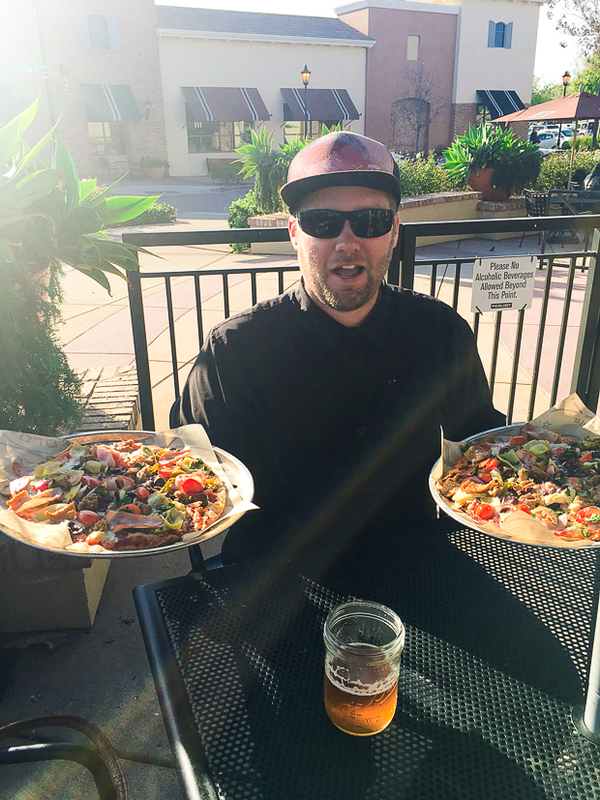 We always prefer to eat outside (why not when the San Diego weather is always so gorgeous?) 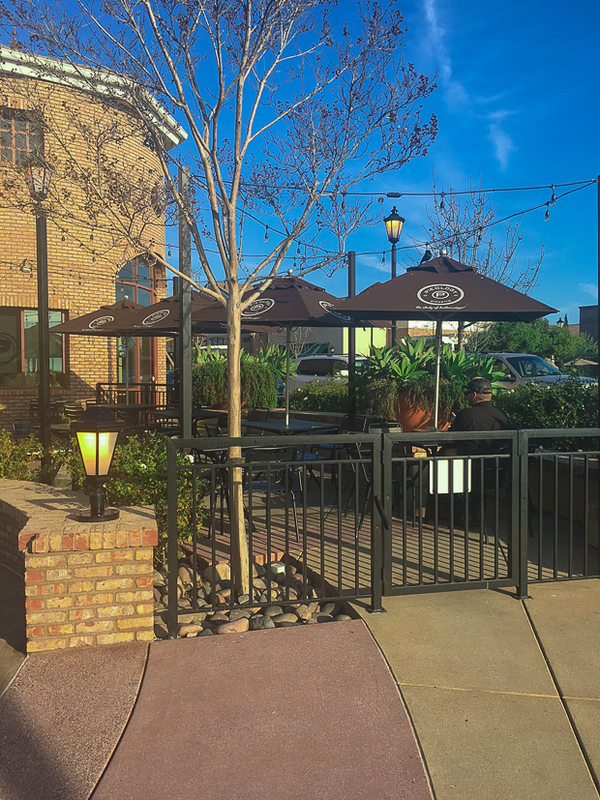 and, since we bring out pups out to eat with us often, we love restaurants that have dog-friendly outdoor patios. It’s always been pretty quiet when we’ve been to Pieology Carlsbad and our pup, Mishka, was perfectly happy cozied up on the patio here. Doesn’t this look relaxing? Where are your favorite cheap date night spots in San Diego? Looking for other dog friendly restaurants in San Diego? As “parents” to three mischievous, yet too-cute-resist chihuahuas, we’re always on the hunt for dog friendly restaurants in San Diego. 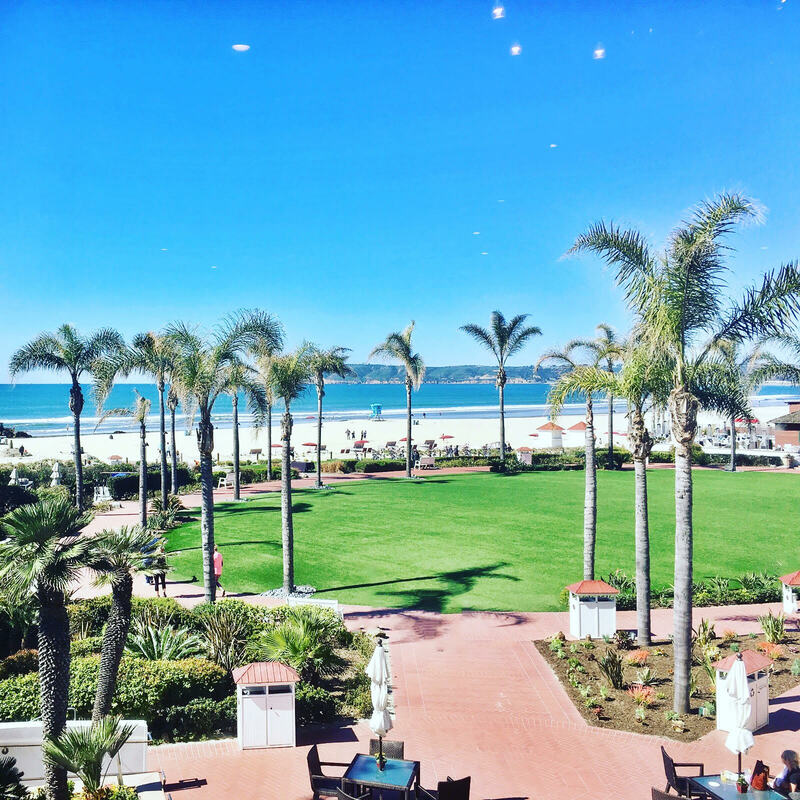 With gorgeous spring weather on the horizon, we headed to Hotel Del Coronado for a Friday afternoon lunch. Hotel Del Coronado is a dog friendly resort, so your pup can dine, stay and play at this classic California hotel by the beach. Pet walking, pet sitting and veterinary services are even available for your pup. Talk about 5-star treatment. It’s easy to see why this hotel is often considered one of the best places to visit in San Diego. Built in 1988, Hotel Del Coronado is a National Historic Landmark that has served esteemed guests from Marilyn Monroe to Franklin D. Roosevelt, and modern-day celebs like Oprah Winfrey and Steve Spielberg. With gorgeous views like these, no wonder celebs would want to call this their home away from home. 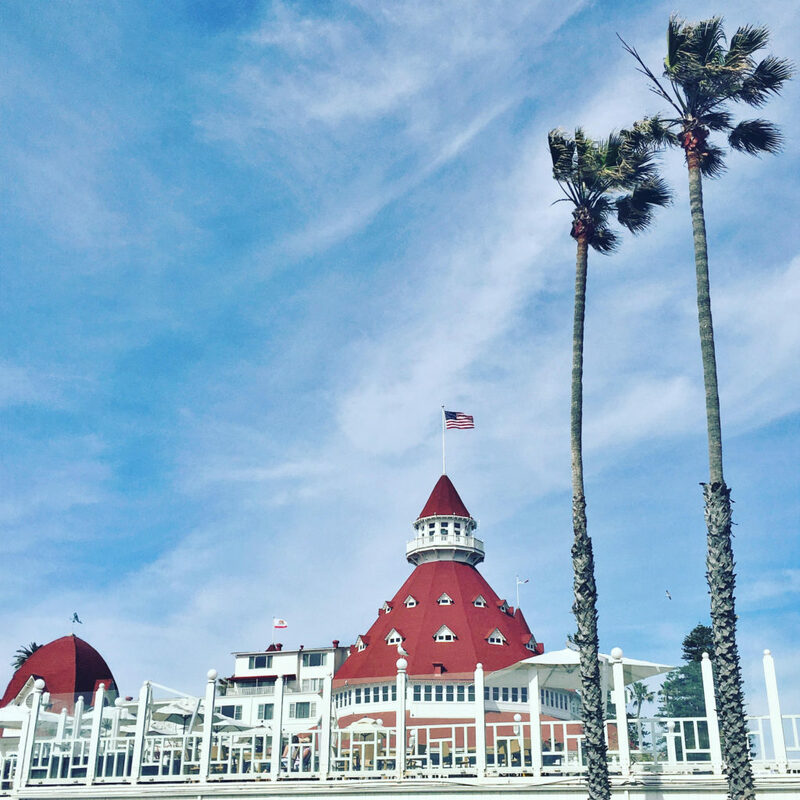 The Del, as it’s affectionately known, has also been rumored to be home to a ghost or two….but we’ll save the ghost stories for another time when we get to stay overnight. We always love a good ghost hunt. 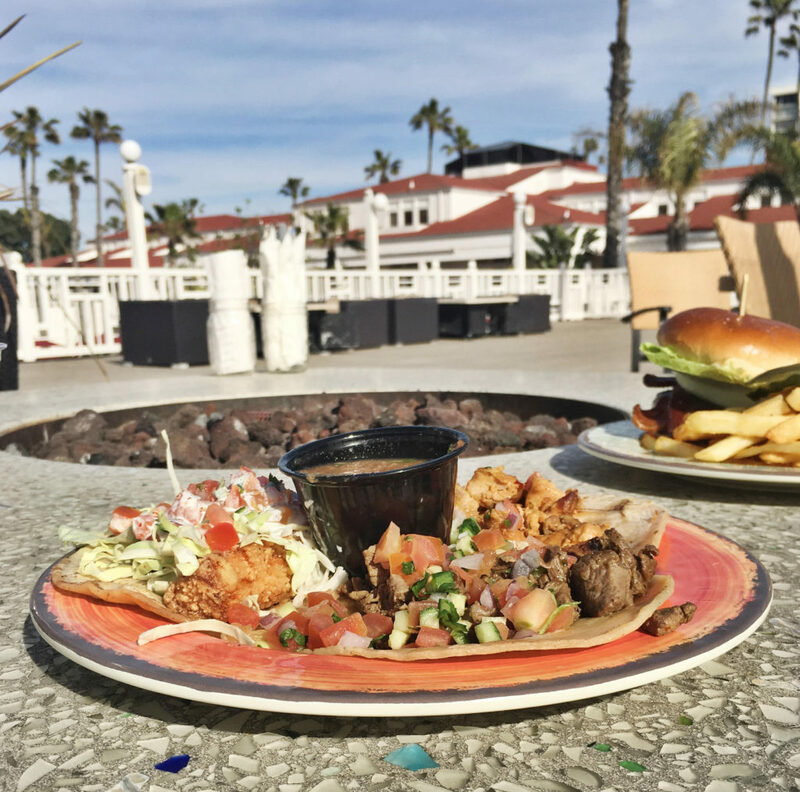 Hotel Del Coronado’s Sun Deck Bar & Grill is a great spot to enjoy ocean views and soak up some California sunshine. We were able to snag a secluded table in a corner complete with a firepit, cushioned lounge chairs, and an incredible view of the ocean. It was just what we needed – it was so cozy, we were tempted to take a nap – and these two did. 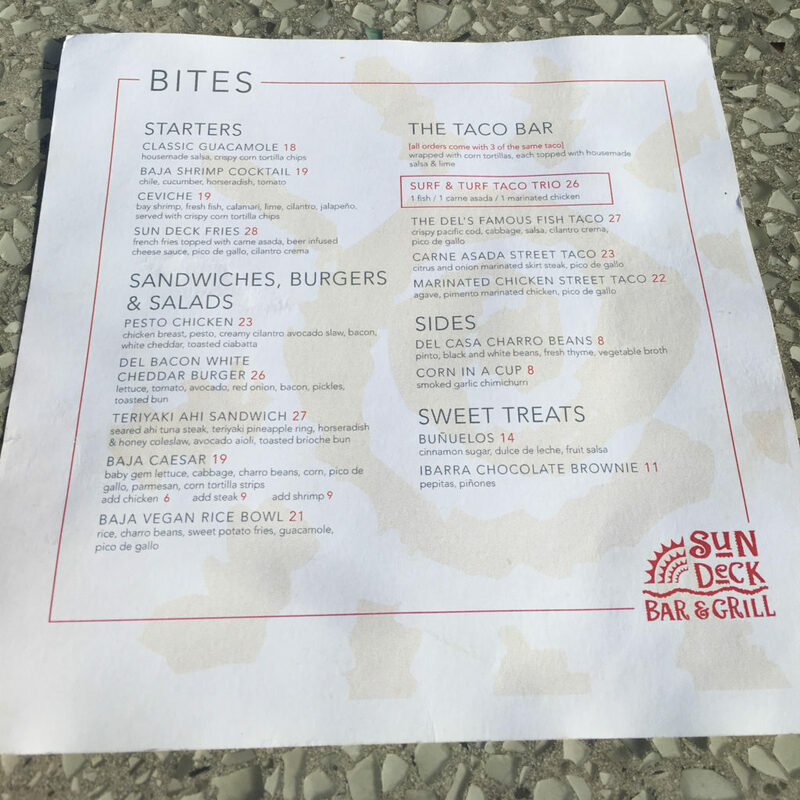 The menu at Sun Deck Bar & Grill offers an array of tropical drinks and Mexican fare, along with the classic American burger. 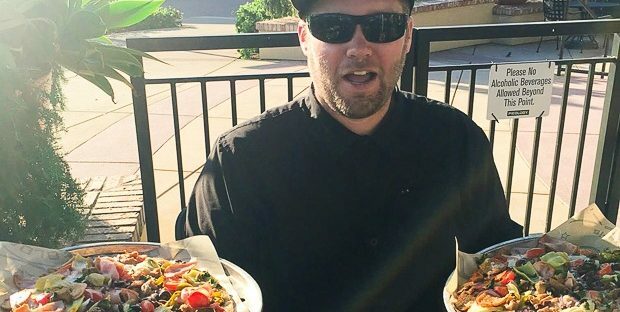 We decided to split a burger and tacos, and Todd also ordered a Coronado Orange Avenue Wit by the Coronado Island Brewing Company. 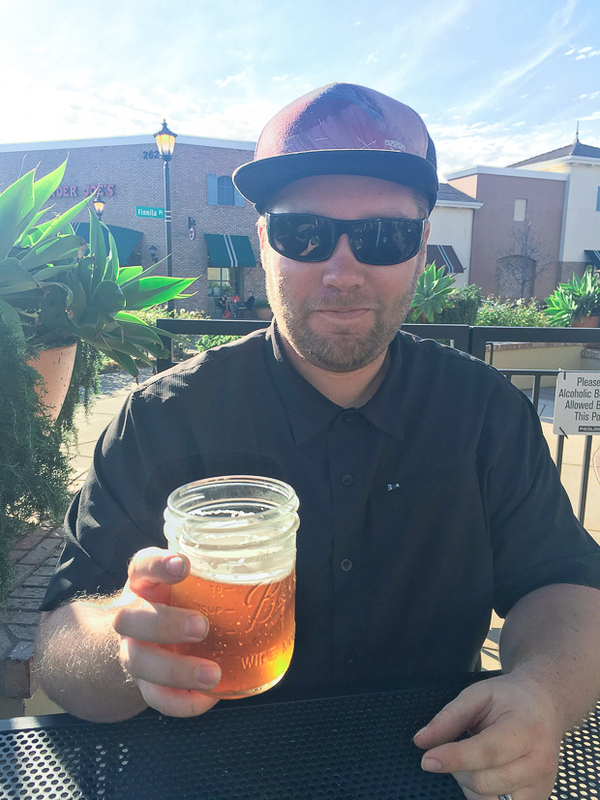 This So-Cal take on a traditional witbier honors Coronado’s main street, which is home to the Coronado Island Brewing Company and was once lined with orange trees. The citrus zing was the perfect complement to a sun-toasted afternoon. 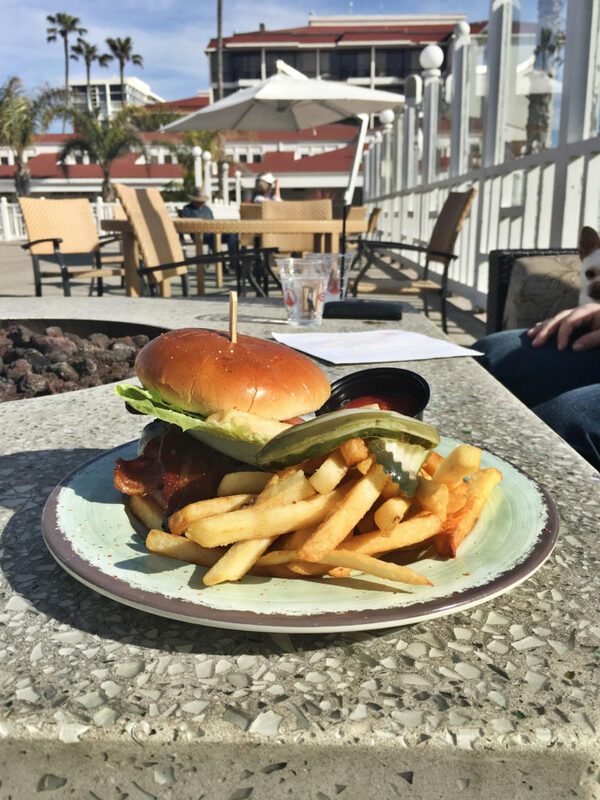 The burger was tasty – you can’t go wrong with classic American fare at a classic California coastal hotel. The tacos were decent, but we probably wouldn’t order them again. 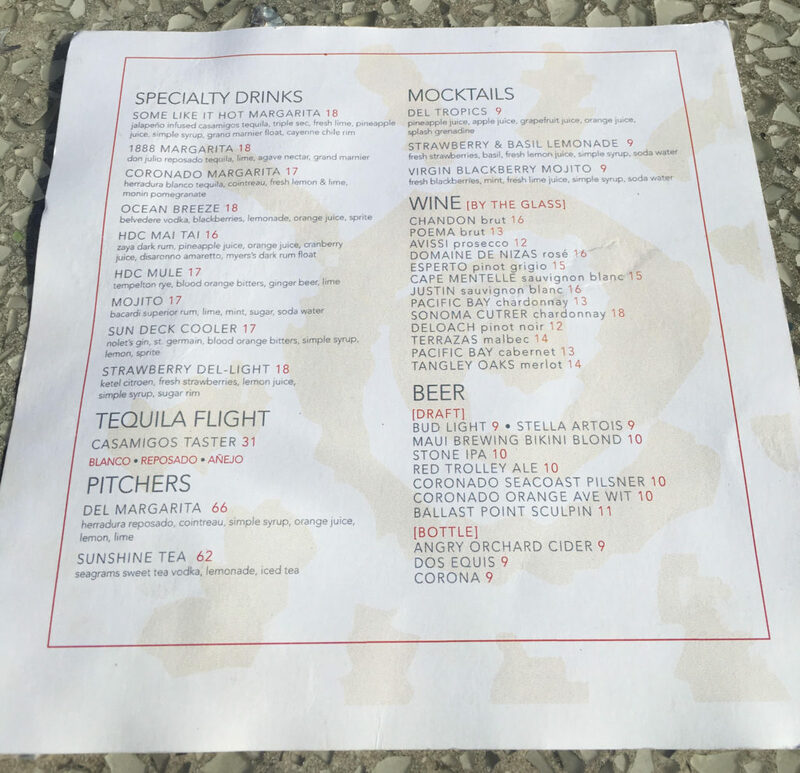 As you’ll see by the menu, the prices at Sun Deck Bar & Grill are a little steep. 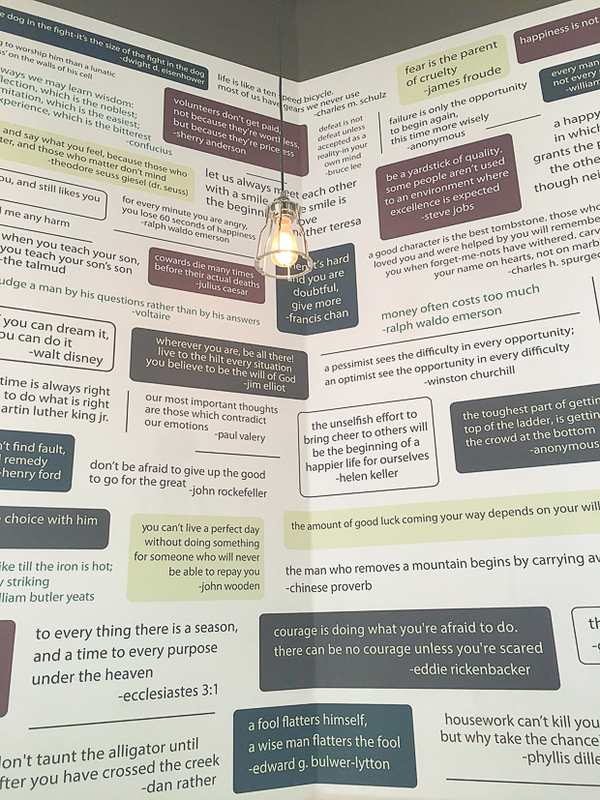 In terms of the view, however, this restaurant wins big among pet friendly restaurants. You’re paying for the atmosphere and incredible views when you dine here. 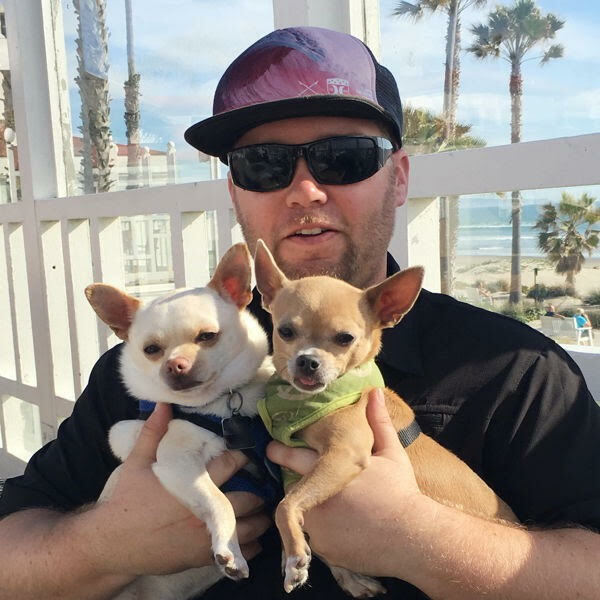 If you’re looking for places to take your dog in San Diego and don’t want to commit to a full meal, we suggest checking out the Sun Deck Bar & Grill’s “Yappy Hour” held every Sunday from 4-5pm. Dogs can lap up complimentary Evian and “yappatizers” (organic gourmet dog treats), while their parents sip on pet-inspired drinks such as a Hair of the Dog, tangy Greyhound or Salty Dog. After lunch, we went for iced coffee at The Del’s cafe and then moseyed onto the beach, where we discovered this masterpiece by The Sand Castle Man. A former construction industry pro who was hit hard by the recession, Bill Pavlacka (aka The Sand Castle Man) turned to building sandcastles. You can even commission him to create a custom sculpture for your engagement, wedding, or just because. Amazing work of art! 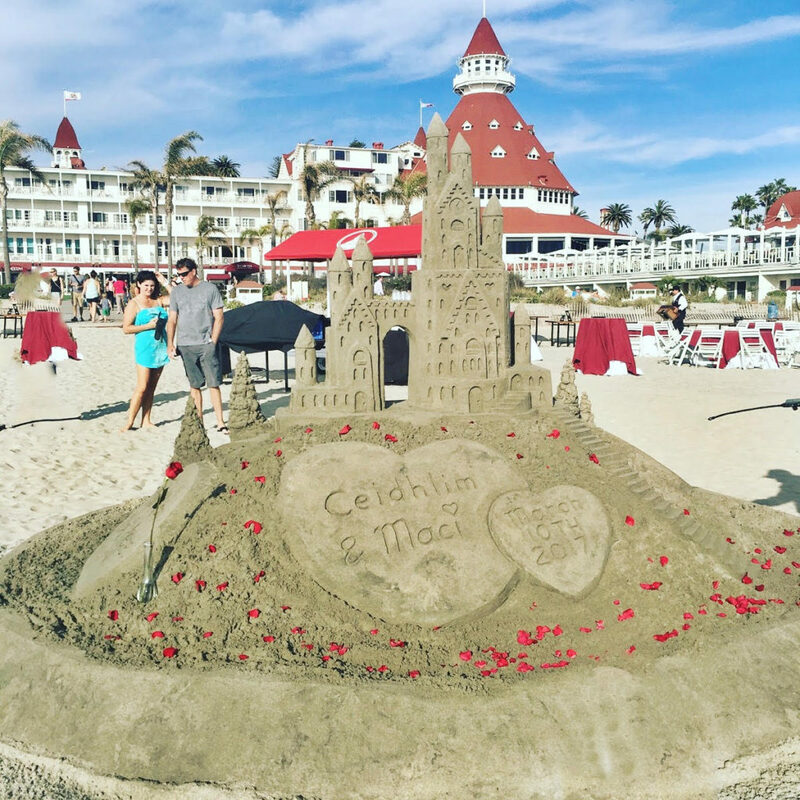 There are many reasons to love San Diego, and The Hotel Del Coronado is one of them. Blue skies, swaying palm trees, toes in the sand…we can’t think of a better way to kick off the weekend. And if you’re already dreaming of a stay at Hotel Del Coronado….go ahead and check the room rates. Welcome to San Diego Hotspots! 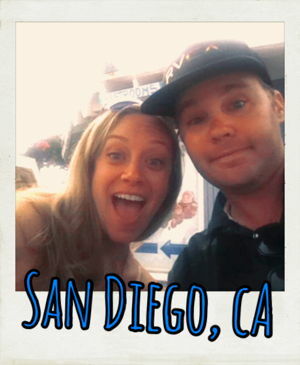 We're Todd and Jeanette, a 30-something couple living in San Diego, CA. Read our story here.